We all love to barbecue or sit around the fire pit, but safe disposal is required when it’s time to put out the fire. 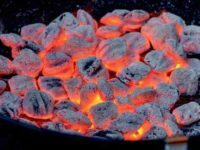 Improperly discarded charcoal and ashes can pose a fire risk and, if placed in a trash bin, can jeopardize the safety and health of the truck driver, disposal and processing facility workers, and the public. Charcoal, charred firewood, and ashes can remain hot enough to start a fire for many hours, perhaps days, after you think the fire is out. As a safety precaution, treat all charcoal, charred wood, and ashes as hot. • Allow charcoal and wood to burn out completely and let ashes cool at least 48 hours. • Dispose of cold ashes by wrapping them in heavy-duty aluminum foil, bagging the foil, and placing it in your outdoor trash can or cart. • If you must dispose of ashes before they are completely cooled, soak them in water and then place them in heavy-duty foil. • Be sure no other combustible materials are near the cart or can where the ashes have been disposed. • Never place ash and coal debris in your recycle cart or bin.